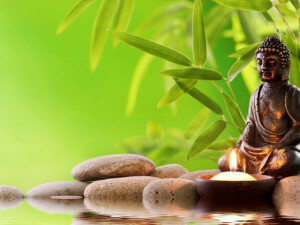 “There are hundreds of methods of meditation, but perhaps Vipassana has a unique status; just the same way as there have been thousands of mystics, but Gautam Buddha has a uniqueness of his own. In many ways he is incomparable. In many ways he has done more for humanity than anybody else. In many ways his search for truth was more sincere, more authentic than anybody else’s. Gautam Buddha has chosen a meditation that can be called the essential meditation. All other meditations are different forms of witnessing, but witnessing is present in every kind of meditation as an essential part; it cannot be avoid ed. Buddha has deleted everything else and kept only the essential part – to witness. In the past a method like Vipassana – which is a Buddhist method – was possible for meditation: just watching the mind silently and meditation happens. Meditation was not something arduous or difficult, but to the Western mind or even to the Eastern mind today – which is absolutely overtaken by the Western ideology – watching the mind is not an easy job. So much garbage and so much crap has been forced into the mind that you go almost crazy just watching it. It is a film that begins but never ends. You can go on watching day in, day out, year in, year out and the mind is always ready to supply new images, new dreams. It is because of this I had to create a few other devices – Dynamic, Kundalini, and others – before you could enter into a silent witnessing meditation like Vipassana. I have made devices to help you cathart, throw out your garbage rather than waste time in watching it. These devices are needed just to clear the rubbish that Christianity has created, and to bring you to a state of naturalness, simplicity … And from there the only way is witnessing, which is called, by Buddha, Vipassana. Vipassana can be done in three ways – you can choose which one suits you the best.The first is: awareness of your actions, your body, your mind, your heart. Walking, you should walk with awareness. Moving your hand, you should move with awareness, knowing perfectly that you are moving the hand. You can move it without any consciousness, like a mechanical thing. You are on a morning walk; you can go on walking without being aware of your feet.Be alert of the movements of your body. While eating, be alert of the movements that are needed for eating. Taking a shower, be alert of the coolness that is coming to you, the water falling on you and the tremendous joy of it…. Just be alert. It should not go on happening in an unconscious state. The second is: becoming aware of breathing. As the breath goes in, your belly starts rising up, and as the breath goes out, your belly starts settling down again. So the second method is to be aware of the belly, its rising and falling. Just the very awareness of the belly rising and falling … And the belly is very close to the life sources because the child is joined with the mother’s life through the navel. Behind the navel is his life’s source. So when the belly rises up, it is really the life energy, the spring of life that is rising up and falling down with each breath. That too is not difficult, and perhaps may be even easier, because it is a single technique. The third is: to be aware of the breath at the entrance, when the breath goes in through your nostrils. Feel it at that extreme ¯ the other polarity from the belly ¯ feel it from the nose. The breath going in gives a certain coolness to your nostrils. Then the breath going out … breath going in, breath going out…. This is a slow, ordinary walk based on the awareness of the feet touching the ground. You can walk in a circle or a line of 10 to 15 steps going back and forth, inside or out of doors. Eyes should be lowered on the ground a few steps ahead. While walking, the attention should go to the contact of each foot as it touches the ground. If other things arise, stop paying attention to the feet, notice what else too your attention and then return to the feet. It is the same technique as in sitting ― but watching a different primary object. You can walk for 20 to 30 minutes. When your breath comes in, observe. For a single moment or a thousandth part of a moment, there is no breathing ― before it turns up, before it turns outward. One breath comes in; then there is a certain point and breathing stops. Then the breathing goes out. When the breath goes out, then again for a single moment, or a part of a moment, breathing stops. Then breathing comes in. Before the breath is turning in or turning out, there is a moment when you are not breathing. In that moment the happening is possible, because when you are not breathing you are not in the world. Understand this: when you are not breathing you are dead; you are still, but dead. But the moment is of such a short duration, you never observe it. Breath coming in is rebirth; breath going out is death. The outgoing breath is synonymous with death; the incoming breath is synonymous with life. So with each breath you are dying and being reborn. The gap between the two is of a very short duration, but keen, sincere observation and attention will make you feel the gap. Then nothing else is needed. You are blessed. You have known; the thing has happened. You are not to train the breath. Leave it just as it is. Why such a simple technique? It looks so simple. Such a simple technique to know the truth? To know the truth means to know that which is neither born nor dies, to know that eternal element which always is. You can know the breath going out, you can know the breath coming in, but you never know the gap between the two. Try it. Suddenly you will get the point ― and you can get it: it is already there. Nothing is to be added to you or to your structure: it is already there. Everything is already there except a certain awareness. So how to do this? First, become aware of the breath coming in. Watch it. Forget everything: just watch breath coming in ― the very passage. When the breath touches your nostrils, feel it there. Then let the breath move in. Move with the breath fully conscious. When you are going down, down, down with the breath, do not miss the breath. Do not go ahead; do not follow behind. Just go with it. Remember this: do not go ahead; do not follow it like a shadow. Be simultaneous with it. Breath and consciousness should become one. The breath goes in; you go in. Only then will it be possible to get the point which is between two breaths. It will not be easy. Move in with the breath, then move out with the breath: in-out, in-out. Buddha tried particularly to use this method, so this method has become a Buddhist method. In Buddhist terminology it is known as ‘Anapanasati Yoga’. And Buddha’s enlightenment was based on this technique ― only this. If you go on practicing breath consciousness, breath awareness, suddenly, on day without knowing, you will come to the interval. As your awareness will become keen and deep and intense, as your awareness will become bracketed ― the whole world is bracketed out; only your breath coming in or going out is your world, the whole arena for your consciousness ― suddenly you are bound to feel the gap in which there is no breath. Watching the gap in the marketplace – Whatsoever you are doing, keep your attention in the gap between the two breaths. But it must be practiced while in activity. We have discussed the technique that is just similar. Now there is only this difference, that this has to be practiced while in worldly activity. This practice is to be done while you are doing something else. You are eating: go on eating, and be attentive to the gap. You are walking: go on walking and be attentive to the gap. You are going to sleep: lie down, let sleep come. But you go on being attentive to the gap. Why in activity? Because activity distracts the mind. Activity calls your attention again and again. Do not be distracted. Be fixed at the gap, and do not stop activity; let the activity continue. You will have two layers of existence ― doing and being. We have two layers of existence: the world of doing and the world of being, the circumference and the center. Go on working on the periphery, on the circumference; do not stop it. But go on working attentively on the center also. What will happen? You activity will become an acting, as if you are playing a part. If this method is practiced, your whole life will become a long drama. You will be an actor playing roles, but constantly centered in the gap. If you forget the gap, then you are not playing roles; you have become the role. Then it is not a drama. You have mistaken it as life. That is what we have done. Everyone thinks he is living life. It is not life. It is just a role ― a part which has been given to you by society, by circumstances, by culture, by tradition, by the country, the situation. You have been given a role. You are playing it; you have become identified with it. To break that identification, use technique. This technique is just to make yourself a psychodrama ― just a play. You are focused in the gap between two breaths, and life moves on, on the periphery. If you attention is at the center, then you attention is not really on the periphery; that is just ‘sub-attention’. It just happens somewhere near your attention. You can feel it, you can know it, but is not significant. It is as if it not happening to you. I will repeat this; if you practice this technique, your whole life will be as if it is not happening to you ― as if it it’s happening to someone else.